Diller Scofidio + Renfro is climbing ever higher near the High Line with their first ever skyscraper. The Wall Street Journal reports that the firm was selected by Related Development to work with the Rockwell Group on an 800 foot tall, 700 unit residential building that will play well with its architectural cousin next door. Elizabeth Diller tells the paper the architects are “very conscious of the adjacency to the High Line.” Indeed. DS+R, along with Field Operations, will be unveiling plans for the third and final section of the High Line at a community meeting tonight. Public School 11 Auditorium 320 West 21st, RSVP to railyards@thehighline.org. 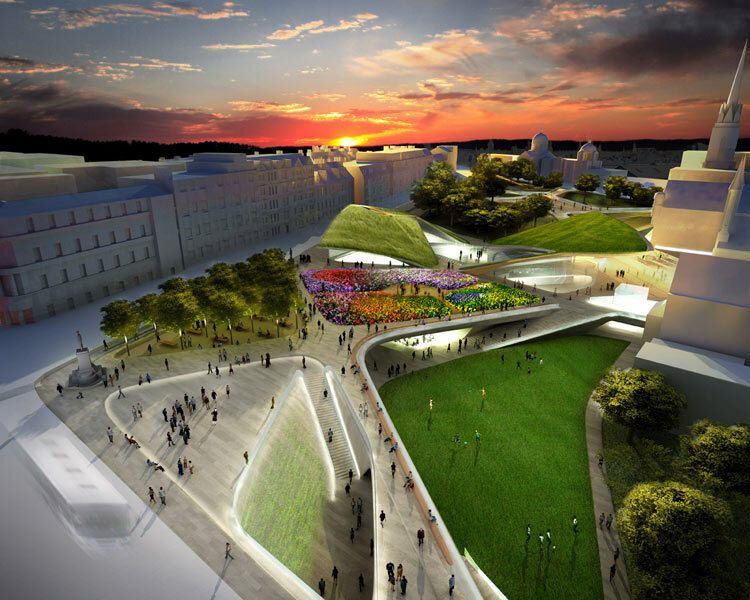 Yesterday voters in Aberdeen, Scotland narrowly approved a plan to transform Union Terrace Gardens in the heart of the city into an ambitious hybrid park and cultural center designed by Diller, Scofidio + Renfro with OLIN, according to The Scotsman. The project is estimated to cost £140 million, though Sir Ian Wood, an oil services tycoon, has pledged £50 million toward the project. 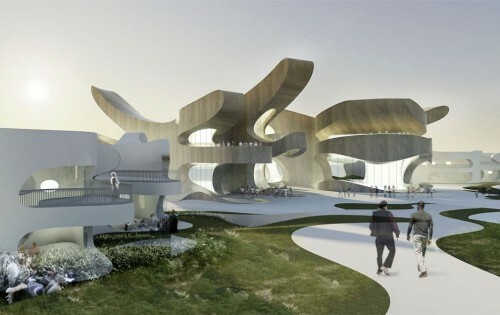 Aberdeen is known as the Granite City, and the design creates a new series of granite pathways criss-crossing over the sloping site, dividing it into different programmatic zones, including an amphitheater, exhibition hall, and a number of gardens. , and Bohlin Cywinski Jackson. SOM will remain on the job to define an overall campus plan. 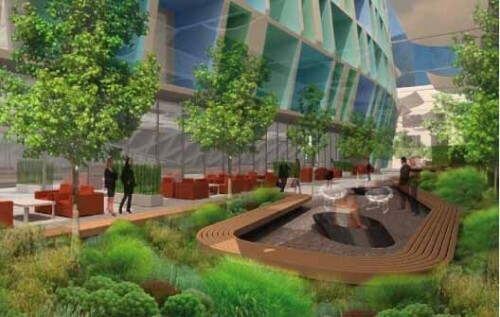 The university is still running with its net-zero plan for the first core building. Residences and other multi-use buildings will follow. A contract with the winning firm is set to be signed in April. Rather than add a few hundred more words to the tens of thousands already devoted to praise the Diller Scofidio + Renfro / FXFOWLE renovation of the Julliard School and Alice Tully Hall, I think today that I will remember the original architect, Pietro Belluschi (1899-1994). As a young faculty member at the University of Virginia, I got to know his work a bit. He designed the UVA School of Architecture. The building was muscular, had clear structure, and well expressed the late 1960s/early ‘70s last gasps of Brutalism. Belluschi was born in Italy, where he earned a degree in civil engineering at the University of Rome. When an opportunity came to move to Portland, Oregon, in the 1920s, he took a position in the architectural office of A.E. Doyle, eventually rising to full partner after the founders passed away. Eventually he gave up his Portland practice to take on the deanship at MIT in 1951. The academic position enabled him to consult on many interesting projects, including with Walter Gropius on the Pan Am Building (now Met Life), and with Skidmore, Owings & Merrill on a number of projects. 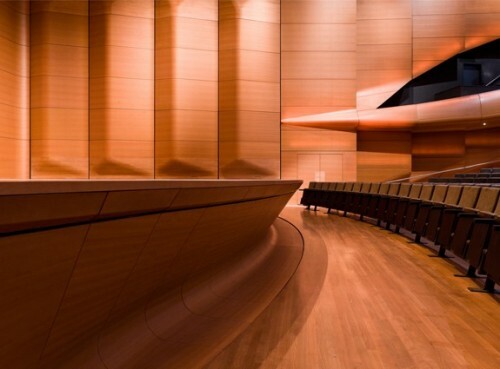 He designed the Julliard School and Alice Tully Hall, a travertine clad essay in late Brutalism which opened in 1969. In 1972, he received the AIA Gold Medal—the highest individual award given by the AIA. You can still see his handiwork—mutated and dematerialized by the expansion of the Julliard School out to Broadway. Benjamin Gilmartin, AIA, of Diller Scofidio + Refro, and acoustician Mark Holden of JaffeHolden conducted today’s tour of the Hall—so there was a lot of talk about the finer points of its acoustics. Holden noted that the original hall had what he called “B+” acoustics, but that because of the aging of the original wood interior—likened by Gilmartin to that of the General Assembly chamber at the United Nations—the sound had lost its “sheen and clarity.” A lot was made of the “intimacy” of the hall. It is covered with a “superskin,” it “blushes” as veneer composite panels are illuminated from behind. I liked the portrait of Alice Tully, standing tall in gold-encrusted evening garb at the age of 80 with her trusty white moppet of a pooch resting at her feet sporting tiny blue satin bows on his ears. She elegantly greets the donors as they proceed to the upper level lobby with the outdoor balcony. It was in use as a conference room when we passed through. Surprisingly underwhelming finishes up there…just gray felt on the walls and grey carpet. I kind of missed those old chandeliers. -Cynthia Phifer Kracauer, AIA For the info on the tour of today’s Building of the Day click here: David Rebenstein Atrium at Lincoln Center. Each “Building of the Day” has received a Design Award from the AIA New York Chapter. For the rest of the month—Archtober—we will write here a personal account about the architectural ideas, the urban contexts, programs, clients, technical innovations, and architects that make these buildings noteworthy. Daily posts will track highlights of New York’s new architecture. Diller Scofidio + Renfro's Broad center for contemporary art features a distinctive structural honeycomb facade. It may be getting a neighbor with another notable facade, a new 19 story apartment building with staggered windows in a variety of sizes designed by Miami-based Arquitectonica. According to blogdowntown, the building would include 258 units with 52 set aside for affordable housing and 308 parking spaces in a three level below-grade garage. 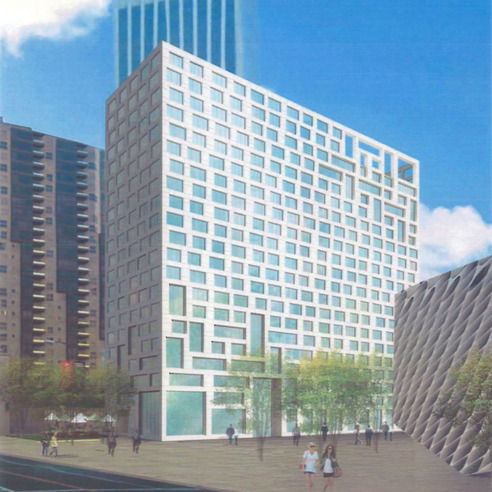 Developed by Related Companies, the tower would share the plaza with DS+R's museum and back up to the planned Regional Connector light rail station. With the High Line getting the lion's share of attention lately, Hudson River Park feels more neighborhoody then ever. Last night's opening of public art installation by artist/performer Jon Morris of Windmill Factory felt pretty down home with everyone sprawling out on the grass around Morris, who explained the inspiration for his light show which sits out in the water. Growing up in Beria, Kentucky, Morris could see the stars, but in New York light pollution made the experience impossible. 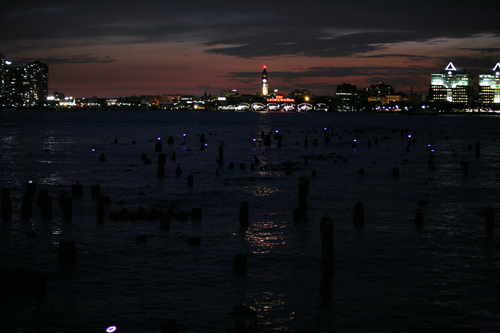 His idea was to sprinkle a little stardust onto the Hudson in the form of solar powered LEDs attached to the tops of pilings from a long departed pier. New Yorkers are in the midst of a deep infatuation with their industrial past. Call it nostalgia, call it reappropriation, call it what you will, but nowhere is it better exemplified than in the High Line. 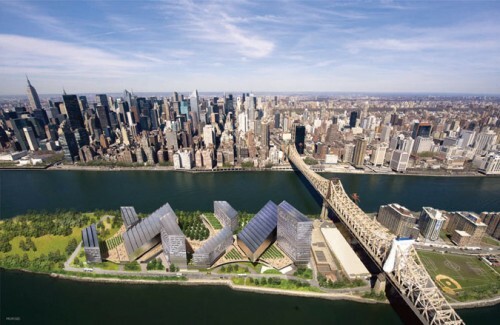 And so there's probably no one better to comment on new art using old infrastructure than Charles Renfro, of High Line-designers Diller Scofidio+Renfro. Renfro recalled how Morris approached him with the idea of placing lights on the pilings about two years ago. Renfro asked him a few key questions: Have you contacted anyone at the Army Corps of Engineers? (No.) Do you know anyone from Hudson River Park? (He did, a friend of a friend who knew somebody.) What about the technical logistics? (He knew someone who worked at Google.) The friend from Google became one of the key players in the installation. Adam Berenzweig is used to dealing with rooms full of computer power, but here he was dealing kilobytes and radio technology, that go under water twice a day at high tide. "It was pretty thorny," he said. The biggest surprise about the project is the relatively low cost, around $25,000. And that it was completed in two years, from concept to execution. Renfro said he was surprised that the project got past Riverkeepers, the the Hudson's ever-vigilant oyster bed protectors. At the river's edge a panel overlooking the pier sends a signal out to the lights, which respond by forming a constellation. When not acting as Orion, the lights dim and flicker gently, shifting from cobalt blue to white. The scene is quiet and subtle, perhaps best happened upon rather than sought out. 60 Seconds Helicopter. The Sikorsky Prize is legendary, for it has not yet been awarded--it's still awaiting its first winner, whose human-powered helicopter will reach an altitude of 3 meters (10 feet) during a flight lasting at least 60 seconds, while remaining in a 10 meter square (32.8 foot square). But Inhabitat reports that if things go as planned, a team of students from the University of Maryland may be taking home the prize with their human-powered flying machine, the Gamera. BIG's beautified universe. Metropolis deconstructs the renderings of Bjarke Ingels Group (BIG)'s latest project: a mosque complex in Tirana, Albania. While the thoughtful octagonal design (an overlap of the Mecca orientation and Tirana's urban grid) may have put BIG in front of the competition, one can't help wonder if the seductive juxtaposition of photo-realism and and benign atmospheric glow in BIG's renderings may be the secret to the firm's running marathon of competition wins. More Getty Trust. Christopher Knight at The Los Angeles Times raises a good point regarding the J. Paul Getty Trust's appointment of James Cuno, currently director of the Art Institute of Chicago, as Trust president and chief executive: It might be a brilliant idea to appoint him to the directorship for the Getty Museum, finally merging the two positions. Suburbia Objectified? Allison Arieff of The New York Times comments on the recently launched Open House, a collaborative project in which the Dutch design collective Droog and Diller Scofidio + Renfro architects imagined "future suburbia." She laments that the project missed the point-- by treating a real place (Levittown) as a "perfect blank canvas" and dodging "the real issues." Curbed LA yesterday shared schemes for the zone around Diller Scofidio + Renfro's Broad Museum, revealing renderings of two residential towers to the south and east of the project and space for a new plaza. The images sent the ever-excitable architecture community chattering. But while it's great to get a better sense of what's going up, as the blog pointed out and the architects have reiterated, the images don't reveal what the design will actually look like. Developed by LA firm Grant Price Architects, the plans were part of a "Concept Study" for LA's Community Redevelopment Agency through developer Related Companies to explore the various configurations on the site. "It’s too early to get an idea of what they could do around the museum," Ted Ogami, Associate Director at Grant Price told AN. "It’s going to go through a number of iterations before they decide what to do." So we still need to wait until DS+R and Broad roll out their scheme for the area. DS+R Senior Associate Kevin Rice, the project director, confirmed that the firm is working under the assumption that they will likely design the plaza, but won't start work on it until that's confirmed in the next few months . Curbed did reveal that an architect for one of the towers is likely to be revealed in 30 days. More things to wait for. So be patient. On Saturday, April 23 the conceptual Dutch design company Droog and Diller Scofidio + Renfro presented "Open House," a project that offered dialogue for possible new social and economic models to revitalize pre-existing suburban neighborhoods. The one-day event began with a symposium at Columbia's off-site Studio-X in Downtown Manhattan, followed by a field trip to Levittown, Long Island, where nine homes from the fabled, archetypal post-war American suburb were transformed into residential marketplaces with experimental installations by designers, architects, and homeowners. "We were inspired by the service economy in New York, where people are outsourcing everything from dog walking to love coaching," Renny Ramakers, co-founder and director of Droog, told the Levittown Tribune. "This service-oriented mentality could be inspiring for people living in the suburbs, especially in economically challenging times." The symposium, featuring talks from Ramakers, Charles Renfro (partner, Diller Scofidio + Renfro), Heleen Mees (economist, Tilburg University), Roo Rogers (entrepreneur and director, Redscout Ventures), Mary Ellen Carroll (conceptual artist) and moderated by Mark Wasuita (Columbia University, GSAPP), kicked off the event with a bundle of critical framing issues. Mees revisited the Marxist notion that "culture follows structure," and how the reach of the service industry in urban cities--abundant and often highly specialized, from doormen to baristas and janitors--contrasted vastly with the experience in suburbs, where sprawl necessarily lowers density and the ability to sustain such a fluid economic model. Wasuita spoke of the changing ideology of suburbia and the individual, citing marijuana growhouses in California residences as an extreme example of how an individual's identity can transform by practicing an alternative use of space. Rogers spoke of collaborative consumption, a system that places on emphasis on service over ownership, as demonstrated by ZipCar's successful car sharing model, while Carroll discussed a long-term project in Houston that includes the repositioning of a house in nearby Sharpstown, Texas, a planned community whose demographics have changed radically over the last decades. All tied into the driving ideas behind the Open House project, which, according to Renfro sought to help people "find their inner service provider" as a means of generating an alternative economy. 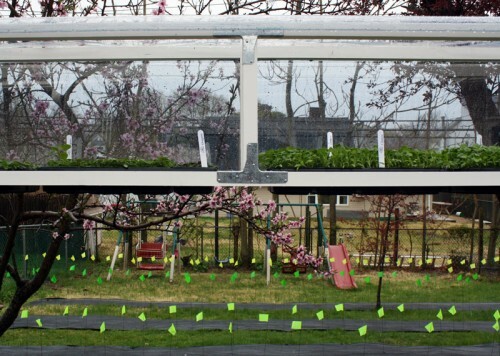 Among the re-imaginings that transformed each home into a personal business: House Dress by L.E.FT playfully wrapped the building exterior in a giant skirt, turning its interior into a casino; Bright Dawn Farm designed by Freecell (pictured) transformed a backyard into an agrarian farm with a 60-foot linear greenhouse; and an installation by EFGH visualized a service-intense masterplan applied to a six-block case study of Levittown. While some designs were loftier than others, the Open House project shows creative ways to generate revenue from home, beyond mowing your neighbor's lawn. Open House is the second of New York-based conceptual projects by Droog Labs, the experimental think-tank arm of the Dutch design company. The first, "Pioneers of Change," took place on Governor's Island in 2009. The recent unveiling of Diller Scofidio + Renfro's Broad Art Foundation has been generating a lot of buzz in the past couple weeks. The defining architectural element of the museum is its porous structural concrete veil which the architects hope will create an interplay between interior and exterior spaces. The Broad's concrete skin won't be Los Angeles' first, however. Sitting just two miles away on Wilshire Boulevard, the American Cement Building features a mid-century veil of its own. 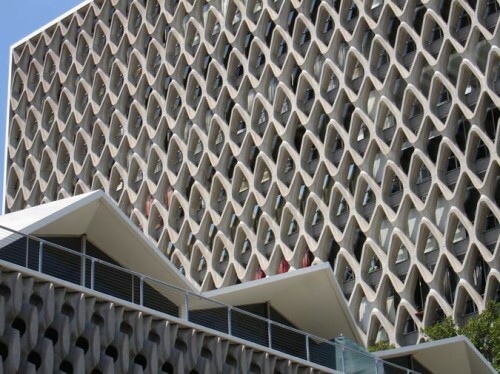 Designed by Salt Lake City's Daniel, Mann, Johnson and Mendenhall (DMJM) in 1964, the latticework concrete facade of the 13-story American Cement Building bears a striking resemblance to that of the Broad's. Originally home to a forward-thinking cement company, the structure has now been converted into residential lofts. The American Cement Building's geometry conforms to the regularity characteristic of its period while the Broad's veil morphs in a way modern computing only allows. It remains to be seen how similar the two buildings end up in the end, but the American Cement Building could offer insights into how the Broad might weather into middle age. When Diller Scofidio + Renfro were solicited last June by Eli Broad to sketch an idea for his new archive and museum, the architects were forced to ask: “What do you build next to Disney Hall?” Answer: Something else. Where Frank Gehry’s work is smooth and impenetrable, the Broad Art Foundation is porous and accessible. The stainless steel concert hall reflects the city’s skyline; blinding sunlight bounces off its capering shell. The Broad’s concrete veil, by contrast, is a less aggressive spectacle. At three-feet thick, and punched through with large angular openings, the new museum looks as if it is cloaked in an ice cube tray twisted by a powerful algorithm. As, certainly, it has been, to pleasing effect. 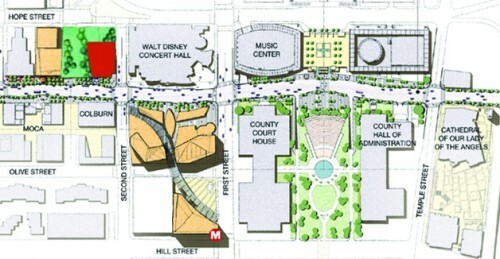 Over time the animated, if a bit too-tidy white box, with its dramatic, carved out entryway – a quote of Diller’s earlier Alice Tully Hall – will settle onto Grand Avenue, a signature building poised not so much to duke it out with Disney as to hold firmly its own ground. The trouble here is that everyone – architects, planners, civic officials, and developers – is convinced that if you plant the right number of monuments on Grand Avenue, the street will become, as Eli Broad says, “the Champs Elysees of Los Angeles.” What they’re looking for is a sidewalk lined by masterpieces. No amount of architecture will transform Bunker Hill – the nation’s longest-running redevelopment project (some would say scam). Broad’s obsession with having architects strut their stuff has obscured the need for a considered response to the city itself— with varied program and a welcoming streetscape—not one street-top civic center. This is not to argue for provincial architecture. But it might be helpful if what goes up on Grand Avenue were considered in its rightful place and not as some moon-shot projectile intended to rescue or restore or resuscitate a barren landscape. For starters, the hill itself is – as it has been elsewhere – trampled, converted into a 3-story garage, as if the slope were actually flat. Why have the architects decided to essentially level a site that drops 200 feet from front to back? An inner truth – not to mention a particular history of human occupancy – resides in this steep hillside, yet the topography is buried. Does this geography communicate no ideas that might be captured in a building and, ultimately, speak to the city at large? And if Los Angeles is truly the center of contemporary art – as Broad and others argued at the unveiling of the museum’s design – why doesn’t the new building reach for a language that breathes the gritty, somewhat toxic perfume that spurs art here. As it is conceived, the Broad is a pleasant museum, with an admirable lobby, an exciting gallery space, and an eye-catching skin, suited to any philanthropist with $130 million to spare. As usual, Los Angeles gets the architecture of anywhere, leaving us to wonder where our city really is and who has the guts to confront it.